Panel beginning soon. Information will be fed back from Kickback live and I'll relay that by posting our tweets here as he updates me. -James says thanks for letting him in to country. Claire first time. Wants to see Star Wars. -Michael - we don't trust Keeper. So Kendall has to stay behind. -Wanted actors who could really carry the part. -Chip! Take a breath man! "When this season is done, you're going to say they were some of the best episodes of Power Rangers EVER"
-Fan Q&A now. Kid asking a question. So cute. -It's the licensing trailer. Same video. 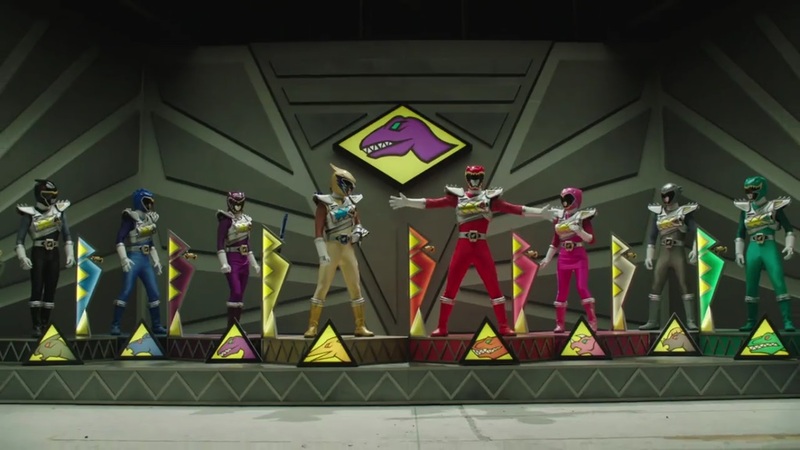 -August 29th return date for Dino Charge! -Dino Drive Ranger suits here, in person! Edit: Not as soon as I was hoping for, but it's good to know when to expect the next new episode. I'll have to marathon the first eight before it airs. Out of curiosity, does anyone know how many episodes this season will be? Oh, and thank you for the coverage. I hope those out there at the con are able to have some fun while doing all the work needed to get info to those of us at home. Dino Charge and Dino Supercharge will most probably be 20 episodes each. I was hopping to see somthing about the new Rangers or if were getting the the MMPR And PRDT Cross over? But i did like every thing i saw. RangerCrew has uploaded the Fall Teaser to Youtube for those who missed the panel. Makes me wonder if we'll get her zord this year, or if that's something they'll save for next year's line. Nice panel. My biggest question though is the pic. What combination is that? It only shows Plesio on the wall though, so will they all be piloting it? Did anyone ask if they planned, like the Super Sentai counterpart did, to have a crossover with the Mighty Morphin and Dino Thunder teams? EDIT: See someone else has already questioned this above. Doh! This was a pretty cool panel.